Oregon’s press again rattles the Huskies in a 68-48 loss in the Pac-12 title game Saturday. But the NCAA tourney is likely to beckon Washington Sunday. LAS VEGAS – For one night, just about everything that could go wrong did go wrong for the Washington Huskies. 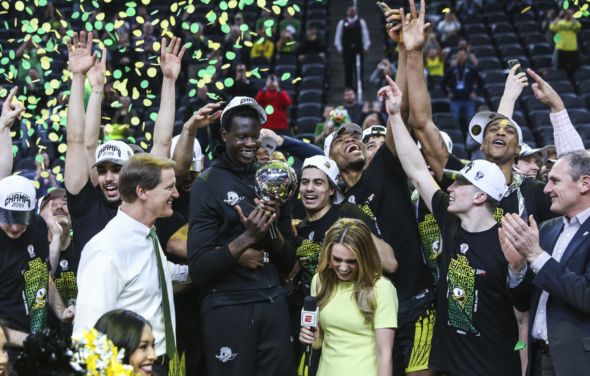 The silver lining was that the Huskies’ 68-48 loss (box) to Oregon Saturday night in the Pac-12 Tournament title game at T-Mobile Arena was not likely fatal to their bid for an NCAA Tournament berth. The sixth-seeded Ducks (23-12), playing through the fatigue of a fourth game in four nights, one more than No. 1 Washington (26-8), earned the conference’s automatic berth in the 68-team field that begins play next week. The Huskies are virtually assured of receiving an at-large berth and will go “dancing” for the first time since the 2010-11 season. The UW high point came 1 minute, 35 seconds into the second half, when Matisse Thybulle became the Pac-12‘s all-time leader in steals. Thybulle stepped in front of an Oregon pass, intercepted it and raced to the other end for a dunk that cut the lead to 30-28. He broke the mark of 321 held by Oregon State’s Gary Payton since since 1990. The play didn’t do much good. Oregon reeled off a 16-0 run to extend the lead to 46-28 with 10:28 left. Noah Dickerson finally got a shot to fall a few moments later to end an 0-for-11 UW shooting drought over eight minutes. No miracle comeback was in the offing. The Huskies in the second half missed 21 of 27 shots (22 percent) as they again had big trouble against Oregon’s full-floor pressure defense that includes four starters all six-foot-9. The Ducks won their fifth tourney title and joined Colorado in 2012 as the only team to win four games in four days at the conference tourney. Payton Pritchard led the Ducks with 20 points, seven assists, six rebounds and four steals. Sunday afternoon, the UW will convene at the coach’s home to find out where and against whom it will begin its tourney saga. The Selection Sunday show airs on CBS at 3 p.m.
By reaching the conference title game, Washington should have no reason to fear a repeat of what happened to the Huskies following the 2011-12 season. Perhaps it was a bit of that history that kept the fire fueled for a three-game conference tourney that really meant little in the grander scheme. In 2011-12 the UW rolled through the conference to win the regular season Pac-12 title against a field considered weak, much as this season has been considered nationally. That year, however, the Huskies exited the conference tournament early and become an ignominious footnote to history — a major conference champion that was left out of the NCAAs. That season began a UW basketball descent that eventually cost coach Lorenzo Romar his job. The Huskies have not been back to the NCAA Tournament since. Romar’s teams never won more than 19 games in a season after that 24-11 team in 2011-12, and fell to a dismal 9-22 in his final UW year. A stellar recruiting class that year held the prospect of saving Romar’s job. It didn’t. Much of the class bolted for what they must have considered greener pastures. The one that didn’t, newly minted Pac-12 Player of the Year Jaylen Nowell, honored his commitment despite the coaching change. Nowell joined a group that had a solid nucleus of sophomores who became the senior class that drove this season. The turnaround under Hopkins was almost instantaneous. A season ago, Washington was 21-13 and made the NIT field. The Huskies head into the NCAA Tournament next week carrying at 26-8 mark, most win since 2009-10 when the Huskies reached the Sweet 16 and finished 26-10. The seniors — Dickerson and Thybulle, along with David Crisp and Dominic Green — have stayed and contributed mightily. Despite another sour game against the Ducks, who won 55-47 at Hec Ed March 9, the reward will be a first NCAA bid for the seniors. Besides Oregon and Washington, Arizona State is a bubble team. As for the future, that appears bright along Montlake as well. Hopkins recruited his old stomping grounds around Syracuse, where he spent more than two decades as an assistant to Jim Boeheim, to get athletic sophomore Nahziah Carter to leave Rochester, N.Y., and come west. In January, he had a commitment from another Rochester product, 6-foot-9 center Isaiah Stewart, to form the cornerstone of a stellar incoming class. Stewart is ranked in the ESPN Top 100 recruits as the No. 4 overall prospect out of high school this year. But that thought is for down the road. Sunday is a day of celebration. Today, optimism springs eternal. Good luck Huskies. Graciousness from a Coug. What a thing. I would really like to see the Husky team use a half court man to man press that falls back into their zone defense. The bench appears to be deep in quick players with length (if not size and offensive skill right now)… let’s use their fouls and create a little bit of chaos on defense, which could lead to easy points for Thybulle, Crisp, Nowell, Green, and Dickerson. Suddenly the offense would be playing in rhythm and having fun with a little bit of swagger. Oh….and Pritchard should have ended up in the 4th row on his breakaway layup last night. He was begging for that type of hit all night (talking to Huskies bench, undercutting Thybulle on a dunk, etc.). A missed opportunity to send a message and reignite a little passion with this team. Not bad coaching there, wabubs. Hop is fairly set in zone principles and doesn’t like to spread the D and have to chase after mistakes. Thanks for the compliment, Art. That’s what I kind of figured about Hopkins and there is nothing wrong in believing in your philosophy….I was just hoping for a bit of a new wrinkle in the defense. All that speed, length, and youth would be fun to see flying around the court for 4-5 minutes at a time. I actually was an assistant in college while getting my degrees (four years with the men at the U. of Puget Sound and one season for the women at Western Montana College). Was a head girls high school coach for six years in the Tacoma area, too. You couldn’t pay me enough to consider being a head coach again. Unfortunately, club teams, parents, and AAU carry way more influence today than is remotely healthy. But you likely already knew that. Painful game to watch. UO has replaced WSU as the school to beat for the Dawgs a long time ago and it’s still a work in progress. Overall though Coach Hopkins has been a godsend for the program. Hopefully he doesn’t follow former WSU MBB coach Tony Bennett’s lead and bolt for an ACC school later on. Time to move past this ugliness and make some noise in the tournament. Despite the loss the Dawgs should still have a better seed and the tournament is a bigger deal than the conference championship anyway. Pretty obvious Hop is destined for Syracuse in a couple of years when Boheim retires. That is indeed the obvious, which is why I don’t think it will happen. No one good wants to be the guy to succeed a legend. Besides, have you been to upstate NY, especially in winter? I agree Art that their is a great deal of difficulty following a legend. But Hopkins plan all along was to do just that. He waited 20+ years as an assistant for that opportunity. Given an offer to coach at UW doesn’t change his ultimate goal. In fact with the success he has had with the Huskies he will sure to be at the top of the list of candidates once Boeheim steps down. I think he will gladly put up with snowdrifts to coach In the ACC and get out of the backwaters of the PAC12. How did that work for Tony Bennett. Gonzaga first, Oregon second, WSU third. Insult to injury is having to listen to Walton call the game! I kind of like Bill Walton’s intellect. We go back a long way. If you saw him play, he created a soft spot in you. Marvelous athlete. Gruesomely unhealthy feet. He’s an acquired taste, and goes down strange rabbit holes, but I would rather him than most. True. But the tangents he goes down are often what entertaining about him. What a sad display – they were completely unprepared, which given they just lost to Oregon, it should have made them better aware of the task. Fortunately there were other programs to watch – 5 minutes of the 2nd half was enough for me! Hop figures to own this one, but having seen Oregon’s D twice, they will be hell on every opponent. Dawgs are a nine seed and will play Utah State.